Want your vacation to last all summer long? It can with a new in ground swimming pool in your back yard. Every dream is different. So is every property. Don’t worry we account for both. By using innovative design and construction techniques, we can create the backyard resort you’ve been dreaming of in just a few short weeks. A well-designed inground swimming pool isn’t just a bunch of water. It can turn your backyard into an elegant outdoor oasis. With waterfalls, vanishing edges and other unique options, an inground swimming pool can serve as a relaxing and inviting centerpiece right in your own backyard. 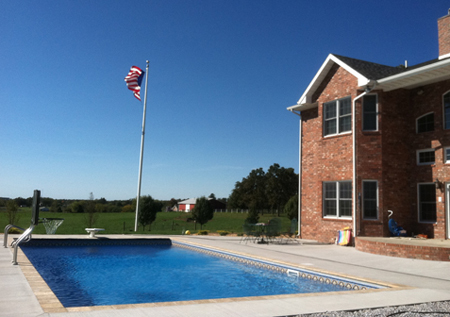 Building an inground swimming pool is a great investment that will reap rewards for a lifetime. A vacation, a movie, or a visit to a theme park will all come to an end, but an inground swimming pool will be enjoyed by your friends and family for years to come. When you build an inground swimming pool, you’re creating a fun and relaxing space for your children and family to spend time together…without ever leaving the backyard! You’ll make lasting memories as you teach your kids to swim, play with them in the pool, and barbeque by the water.